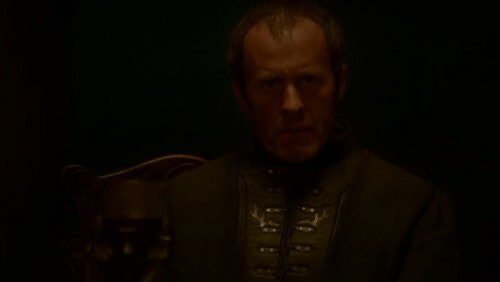 The second of the three Baratheon brothers, Stannis is a bare year younger than King Robert, but the difference between them is night and day. Although both are tall, Stannis is lean, balding, and his beard is closely trimmed in contrast to the king’s. Moreover, his personality is vastly different: taciturn, strict, and remote. His views on justice are similarly harsh. During the rebellion, he held Storm’s End through a year of siege, and after King’s Landing fell he commaned the royal fleet that took Dragonstone. Robert made him master of ships on the small council, and then gave him the rule of Dragonstone—a sore point for Stannis, who expected to receive the much richer family seat of Storm’s End.